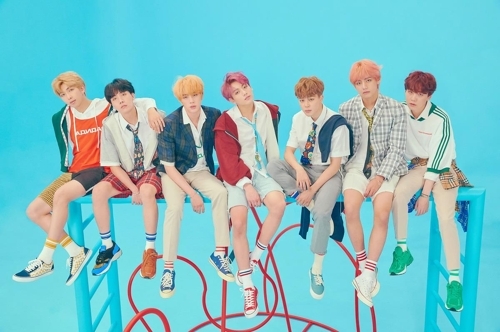 SEOUL, Aug. 29 (Yonhap) — K-pop stars BTS had two of their albums ranked on the Billboard chart of the 200 most popular albums for the 14th week in a row Wednesday. “Love Yourself: Tear” and “Love Yourself: Her,” released in May this year and September last year, respectively, were ranked 87th and 198th on the weekly updated Billboard 200 chart, according to the U.S. pop magazine’s website and the boy band’s management agency. It is the 14th straight week both albums have been listed on the key U.S. music chart since “Love Yourself: Tear” landed atop the album chart within the two weeks of its release in May. For “Love Yourself: Hear,” it is the 44th consecutive week it has stayed on the chart. The septet also broke its own record this week by topping the Billboard Social 50 chart, the list of the most popular artists, for the 59th week in a row. It is the longest streak for any artist to take the top spot. Last week, BTS released the fourth and final leg of the “Love Yourself” album series, which immediately took local music charts and iTunes single and album charts in over 60 countries by storm.